We visited Rolley Lake on a Saturday in September: it was a beautiful sunny day, people were picnicking and even swimming. I wanted to swim too, but dad wouldn't let me...Nathan and dad wanted to fish. We fished for about two hours but we didn't catch anything...the trout were jumping every time we looked so I guess we didn't catch any fish because our bait was no good. After fishing we went for a walk on the trail around the lake. Dad said the walk would only take 20 minutes, but it took an hour and I started whining that my legs were too tired. Even though I got tired, it was a nice forested walk with some ups and downs and a boardwalk through marshy areas at one end of the lake. You can also walk to the Rolley Falls (about 15 minutes) but we didn't. Perfect sized lake for swimming, canoeing and fishing. 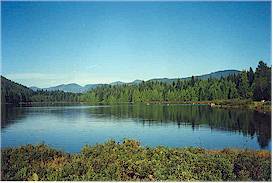 Rolley Lake park is about 115 hectare in size, and is approximated 60 km east of Vancouver. From Vancouver drive to Pitt Meadows. Take Dewdney Trunk Road from around Pitt Meadows (at the intersection where there's a huge Chinese buffet restaurant). Continue along Dewdney Trunk Rd. past the town of Haney to Bell Road, make a left turn and drive north to the park (the park is at the end of Bell Road). 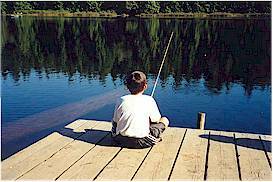 The lake is stocked with Cutthroat and Rainbow trout. No power boats are permitted on Rolley Lake. Rolley Lake was named after newlyweds, James and Fanny Rolley who first homesteaded on its shores in 1888. They stayed there for 10 years, then moved on. Mom and dad enjoyed the walk around the lake which takes about an hour, about the right amount of time before we start whining that we're tired.